To those who have read the Bible, the Philistines were a major enemy of the tribes of Israel. Judges and Samuel describe constant warfare between the Philistines trying to conquer the land and the Jews trying to defend it. Today, the word “philistine,” has nothing to do with a person’s ethnic origins. Describing people as philistines means they lack taste and do not care about culture or refinement. They are boors. On a recent trip to Ashdod, we visited the Corinne Mamane Museum of Philistine Culture in Ashdod. There we saw examples of their pottery and other artifacts, and learned about their culture. The word “philistine” has now taken on a whole new meaning for me. As one of the Philistines’ five cities, Ashdod is a fitting place for a museum dedicated to their culture and history. Their other cities were Gat, Ashkelon, Gaza, and Ekron. The locations of Philistine Gaza and Ashkelon are known. Archeologists are fairly sure they have identified ancient Gat and Ekron as well. The Philistines were the sea people. They arrived on the southeastern rim of the Mediterranean from Crete or Cyprus around 1200 BCE. This was same period that the Tribes of Israel came to the area from the desert on the east. Both groups wanted to take over the land from the Canaanite kings. Conflict was inevitable. depicts a battle in the time of Pharaoh Thutmose, who is thought to be the Pharaoh of the Jewish exodus from Egypt. The carving shows the Philistines, in full battle dress. The design of the Philistine metal helmets show impressive metal working skill. So do the fragments of their weapons that have been found. A metal statue of a Philistine in full battle dress stands in the foyer of the Ashdod Museum. Like almost everyone else who visits the museum, Allen and I stood next to it for a photo. The Philistines tended to adopt things from all the cultures they came in contact with. We can see that in their names. In their early years in Canaan, names were of Indo-European origin. In later centuries they had more Canaanite names. and appreciate the artistry and craftsmanship of the people. Jugs dating from the 12th to 11th century BCE are northern Mediterranean in style. Later pottery show the influence of other trading peoples. 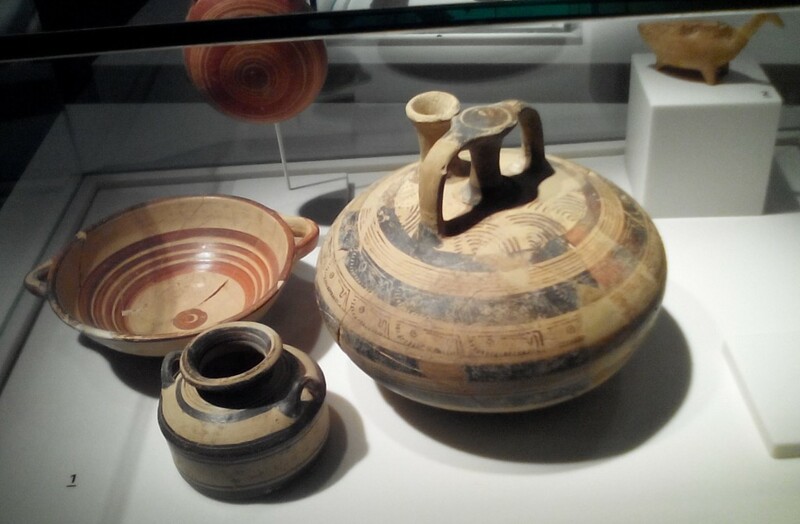 The vessels in the photo are from the 10th to 9th century BCE and show a distinct Aegean influence. The red color and shape are local style, but the black color and horizontal bands are Aegean. An approximately six inch tall clay figurine from the 12th century BCE caught my attention. She was found in Ashdod, and named Ashdoda by those who uncovered her. Half woman and half chair, she is thought to be a 12th century BCE cultic figure. When the sculptor Henry Moore visited the museum, he remarked that if he had known of her existence, he would have made her his muse. Ashdoda’s true role in Philistine culture is only speculation. We know very little about their religion. The Bible says they worshiped Dagon. Whether he was a grain god (from dagan, grain) or a fish god (from dag, fish) no one today knows. The discovery of a two-horned altar and an incense altar only emphasize how little we know about their religion. Many altars of the time had horns at their corners, but why does this one have only two? Did the two horns have a specific cultic meaning, or has only half the altar been found? If they created and used all this beauty, how did their name become a label for boorish and uncultured? The worshipers of one God looked down on those who worshiped idols. They ascribed many bad traits to the idol worshipers, including a lack of appreciation of the finer things in life. Thus Philistine evolved to philistine. For several centuries, they were the dominant people along the Mediterranean Coast. Then the Israelite kingdoms expanded. Still later the Egyptian and Assyrian kingdoms strengthened and expanded, and conquered the Philistines. They assimilated into new cultures, and disappeared from history. But history has a way of reviving and reinventing peoples in unexpected ways. When the Romans put down the Great Revolt in 70 C. E. they were sure they had destroyed the Jewish state for all time. Fifty-five years later, during the Bar Kochba Revolt, the Romans had to destroy it again. Determined to destroy all traces of the people who had fought them so long, the Romans gave the area a new name. They named it Palestina, after the Philistines, the ancient enemy of Judea. After World War I, the British received a mandate to administer a large swath of the dismantled Turkish Empire. The Turks had called it South Syria; the British called it Palestine. Once the Philistines had been proud rulers of a large portion of today’s Israel. Today we think of them as philistines, uncultured people lacking in taste. The re-inventions of history are not always kind.